So, here we have The Witchengine Protocol. It is, more or less, a magickal energy filter/generator, simple and highly effective. It is a construct, somewhere between Sigil and Servitor, and makes for an excellent addition to talismans and such. Properly crafted, the sigil does what it does, and requires no “firing” much like the Ellis sigil. The concept of the Witchengine Protocol came about many years ago, and was developed by my brother Silenced, and we would bind the concept (much like a computer program for reality) into a physical edifice- usually a stone sphere or obelisk, but the enchantment was unweildy. I mean, sure, we could give people the rock and it would work, but as far as a large scale “here, have an effective magickal energy filter/generator to do with as you will”, it wasn’t very functional. I finally managed to distill the concept into a Sigil form, for widespread use. What it essentially does is (see input on picture above) it gathers incoming or ambient energy (you can program the input to take in any sort of energy you wish via your intent as you draw it- it’s a good idea to program it to not try to eat your other magickal endeavors, for instance) and draws it into the box. The intent behind the straight and spiky nature of the input is to break up and confound the incoming energies into more or less random harmless bits. Now, once this energy has been funneled into the center of the construct, this is where the filtering happens- and you must consider this blank space and the action of the output with intent as you draw it- its flow is reversed and forced into the smooth flowing lines of the output (see above) and into whatever use you wish to put it, whether it be powering a talisman (works beautifully bound inside a protective talisman) or other magickal working, or just leaving it running like an air filter in places that have the “Ick” or to keep the energies in your house nice and fresh. 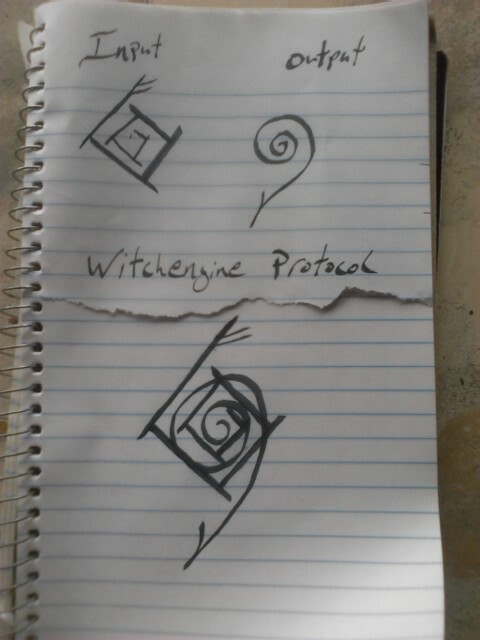 I have bound this symbol, using the linking sigil concept, to the original Witchengine Protocol, and it is this that aids in the filtering, and provides a little extra spin on the backend.